Peter Salerno, Inc. – Page 3 – Design Your Lifestyle. Our final article on official 2019 NFL team Pantone colors focuses on the AFC South and AFC West divisions. If you love blue, the AFC South is the color design division for you – each of its 4 franchises (Texans, Colts, Jaguars and Titans) uses at least one variant of blue in its official color scheme. Each of the four AFC West franchises has come to be defined by its historic colors – the dark blue and orange of Denver, Kansas City’s bright red and gold, the Chargers’ bolts of gold (and historic “throwback” powder blue), and the Raiders’ legendary silver and black. Note: Some color names (“gray”, “silver”, etc.) are over-arching color names for Pantone colors without a specific title. Please refer to the color codes under each graphic for the exact specifications for each team’s variant of those colors. (In particular, note the varieties of blue and gray/silver among these teams in particular!) We have limited each set to the 2-3 prevailing colors for each team and chose jersey colors over helmet colors. Also, there is no Pantone code for white unless an opaque white is specified. In terms of color palettes, the NFL franchises of the NFC South and NFC West present some of our very favorites. From the trendy Seattle Seahawks to the classic San Francisco 49ers, the warm and bright Tampa Bay Buccaneers to the old gold and neutrals of the New Orleans Saints, these 8 NFL teams provide something to love for any fan of color design. Toss in the classic Carolina Blue of the Panthers, the smoking-hot reds of the Falcons and Cardinals, and the new-era metallic gold of the Rams, and the teams of the NFC South and NFC West are a feast for the eyes. Note: Some color names (“gray”, “silver”, etc.) are over-arching color names for Pantone colors without a specific title. Please refer to the color codes under each graphic for the exact specifications for each team’s variant of those colors. (In particular, note the varieties of red and silver among these teams in particular!) We have limited each set to the 2-3 prevailing colors for each team and chose jersey colors over helmet colors. Also, there is no Pantone code for white unless an opaque white is specified. Courage is always in style. 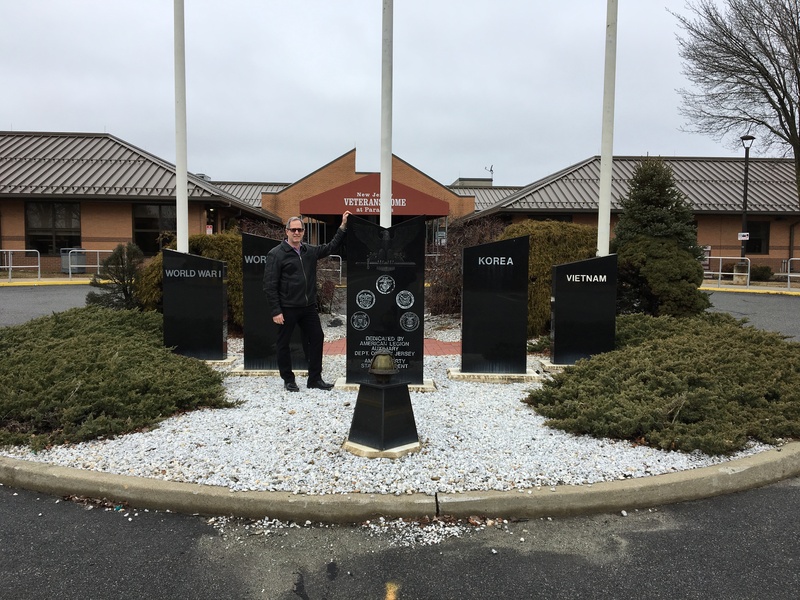 When Peter Salerno and his daughter Gabrielle had the opportunity to visit the Veterans Memorial Home in Paramus, New Jersey, it was an offer that they couldn’t pass up. A veteran of the United States Navy, Peter Salerno (owner of Peter Salerno Inc., the most award-winning North American custom kitchen and bath design firm of the 21st century) was humbled and honored to spend time with the residents of the Veterans Memorial Home. Operated by the State of New Jersey Department of Military and Veterans Affairs, the Paramus Veterans Memorial Home is a living love letter to those who have sacrificed bravely for the United States. 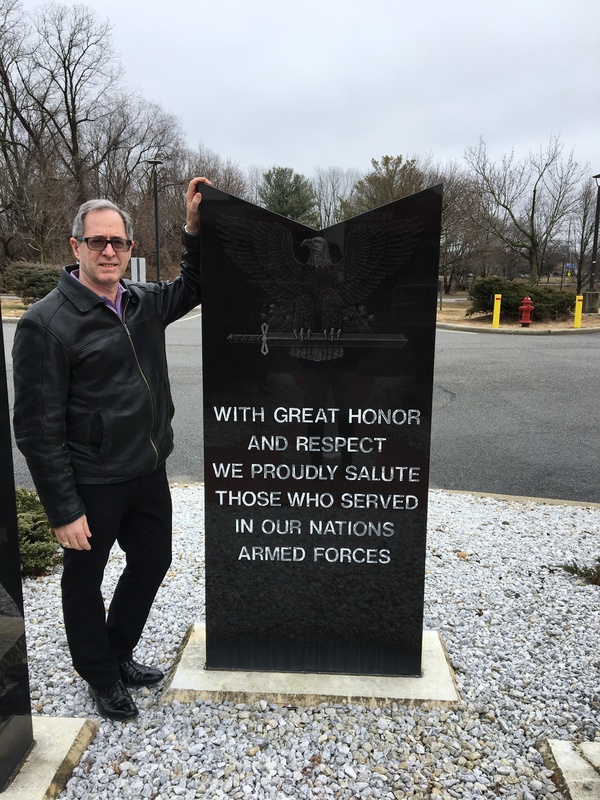 Peter Salerno visits the Paramus Veterans Memorial Home in NJ. Peter and Gabrielle experienced an informative, life-changing tour, led expertly by two individuals: Anthony, the Home’s Recreation Director, and Susan, its Volunteer Director. To honor and serve the Military Veteran, their spouses and Gold Star Parents by consistently providing the highest quality of resident directed long term care by maintaining excellence in personal services and treatment through professional collaboration, innovation and dedication; in a setting that promotes dignity and independence…. Our Homes provide a dignified environment to Veterans who have honorably served our country, and are now in need for nursing home services. The Veterans Memorial Home is a beautiful facility, but the true beauty of the Home is its residents. The oldest residents are 102 years old and are proud veterans of World War II. Meeting these individuals was a privilege that Peter Salerno states he “will never forget”. The benefits of the Home extend from veterans to their spouses, as well as to qualifying Gold Star parents of military veterans. 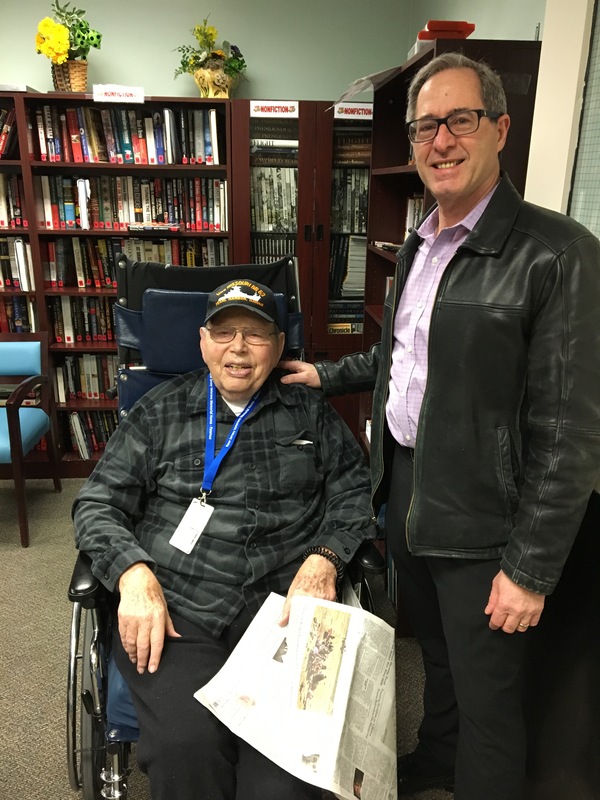 After his tour, Peter Salerno signed up to become a volunteer at the Paramus Veterans Memorial Homes. Peter and his family encourage citizens of New Jersey to explore becoming volunteers at these valuable Homes – volunteer efforts are greatly needed, and any amount of time one can dedicate is of tremendous value. It was a day of gratitude for Peter Salerno and Gabrielle Mayer. Thank you to the volunteers who guided this wonderful tour, the NJ Veterans Affairs Department for housing our invaluable veterans and military heroes, and to the veterans of the United States Military for all they have given our country. 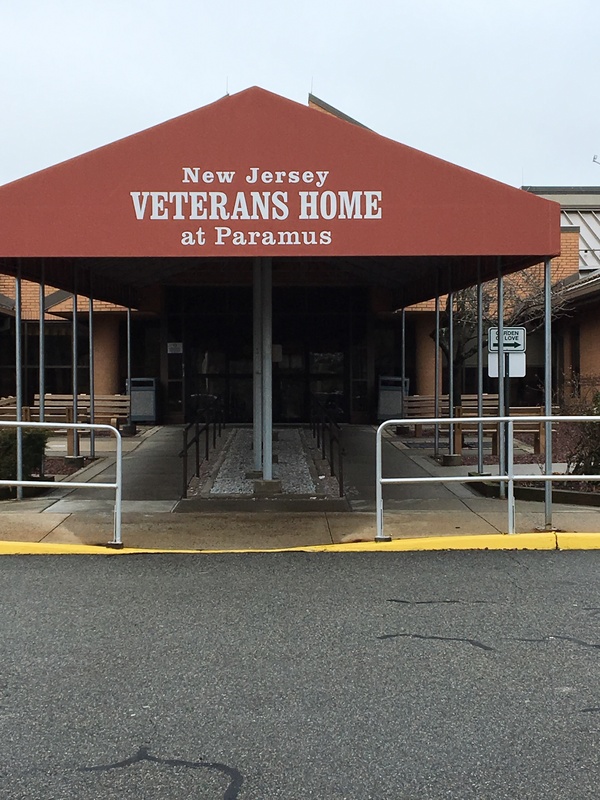 For more information about the Paramus Veterans Memorial Home and all the Homes in New Jersey, please visit the official website of NJ Veterans Affairs. January 2019 Peter Salerno, Inc.
“The response was so overwhelming I had no choice but to start putting together recipes immediately, so here we are!” Peter recently explained to us in a phone interview. 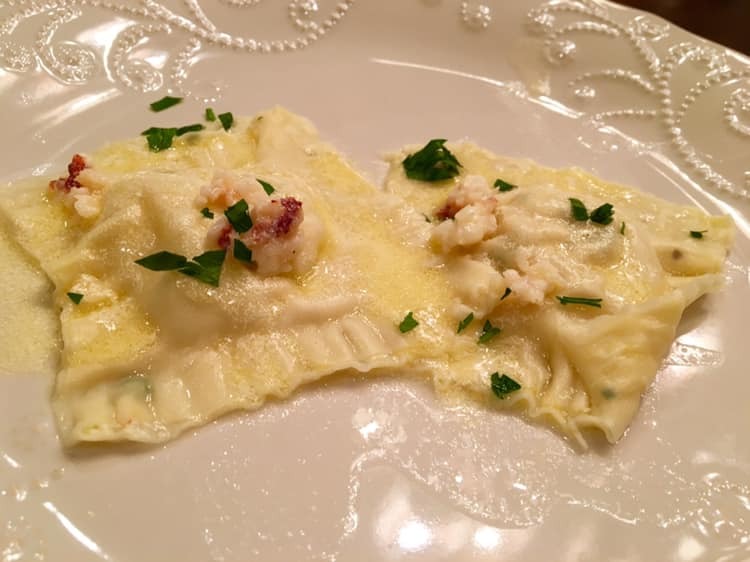 Lobster ravioli with Grand Marnier sauce, all made from scratch – to appear in Peter Salerno’s pasta cookbook. 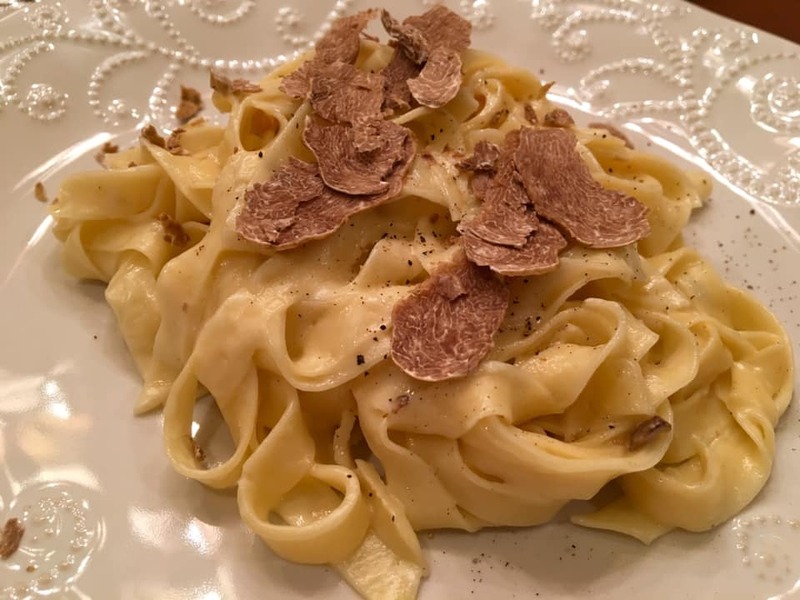 As a result, Peter is now hard at work refining and perfecting all 8 pasta recipes, based on Sicilian tradition, family secrets, and his travels to fine dining establishments, conversations with world-class chefs, and attending CIA culinary classes. As if THAT wasn’t enough to get you drooling, Peter also announced a partnership with David Hamburger of Acker, Merrall & Condit, wine merchants of New York City since 1820. David is a top wine educator, and will be working closely with Peter Salerno to create exceptional wine pairings for each of these pasta dishes! The pasta cookbook will only be the first in a series of installments from Peter Salerno, who states that pasta felt like the most organic place to start the series. 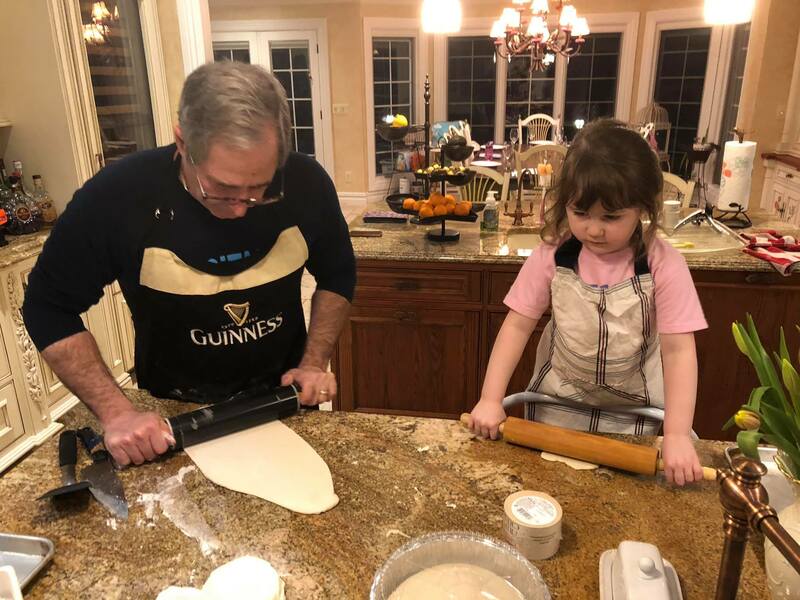 Peter Salerno creates homemade pasta with his granddaughter, Jesse. For Peter Salerno, one of the real joys of creating pasta dishes is the ability to do so with his family. In the beautiful moment captured above, Peter Salerno rolls out homemade fettuccine with his granddaughter Jesse. It’s part of the Salerno family tradition, passing down old-world Sicilian traditions and recipes through generations. 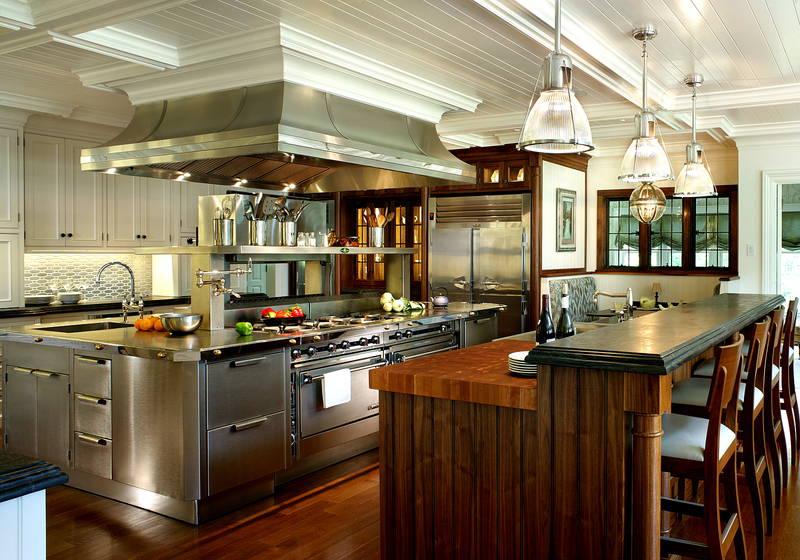 Part of Peter’s appeal as a custom kitchen designer is his expertise in actually using kitchen design to its fullest. For over two decades, professional chefs and avid home cooks have trusted Peter Salerno Inc. to create state-of-the-art kitchen designs that not only look beautiful, but function as a world-class, operational kitchen. So, we’re curious – which of the eight pasta dishes listed above sounds most appetizing to you? Which one are you most excited to see appear in Peter Salerno’s forthcoming cookbook? Let us know in the comments below!